The year following a World Cup is often just as hectic, if not as well-watched, as the year of the tournament, and 2011 brought its fair share of excitement, change, and disappointment to the US National Team. Over the next few weeks, Ben and I will publish our final thoughts on the 2011 campaign. Notably, we’ll compare the final days of Bob Bradley’s reign to the opening hours of the Jurgen Klinsmann era. We’ll begin by evaluating the offensive statistics produced by the two regimes. Bradley developed a reputation for crafting a disciplined but somewhat staid squad while Jurgen Klinsmann entered the scene to great expectations of a more fluid attack. Ironically, the stats show the opposite. The offensive struggles of Klinsmann’s USA are well-documented, but it might surprise you to see how much better the attack was under Bradley. Thanks to MLS’ partnership with Opta, anyone with the time and energy to visit their site has access to US National Team chalkboards, beginning with the 2-1 loss to Panama in the Gold Cup. The following chart documents key offensive statistics from Bradley’s final five matches and Klinsmann’s first seven. Bradley’s attack comes out on top in every single category. We think there are three key factors that lead to the stats being skewed so heavily in Bradley’s favor. Simply put: Klinsmann’s squads lined up against higher quality opponents. His weakest opposition (either Costa Rica or Ecudaor) would be favored against all but one of Bradley’s opponents. To draw a better comparison, we’d have to contrast the two managers when their teams played the same opponent. As (bad) luck would have it, they both played Mexico but the chalkboards for Klinsmann’s Mexico match aren’t functioning (you can try to visit the site yourself). Of course, Klinsmann drew and Bradley lost so it wasn’t all roses for the current Egypt gaffer. Still, even when the opponent is the same, Bradley’s offense comes out on top, if slightly. Given that Klinsmann, as a new manager, has been trying to find his preferred formation and personnel groupings, it seems a little disingenuous to even attempt to compare the two. However, Bradley’s final matches were marked by almost as much tinkering as Klinsmann’s opening encounters. 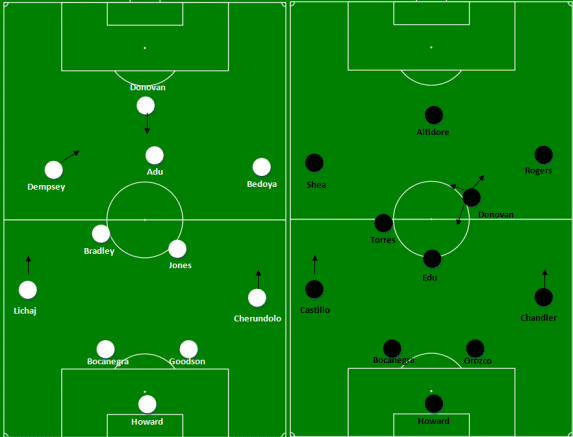 Both managers (Bradley - left - against Mexico, Klinsmann against Costa Rica) played some attack-minded formations. The key to each was the use of Landon Donovan. At the beginning of 2011, Bradley began to experiment with a 4-2-3-1. We think an injury to Stuart Holden ultimately put that plan on hold, but by the end of the Gold Cup he was using it again. He wasn’t merely using an unadventurous 4-2-3-1 either. In the final, he used a very attack-minded front four: Clint Dempsey, Freddy Adu, Landon Donovan, and Alejandro Bedoya. Oh, and Donovan was operating as a false-nine. Even though the US lost the game, some of the combinations provided by that quartet were more fluid than anything Klinsmann’s squads have created, excepting perhaps the first half of the Costa Rica match. Devout followers of the US National Team are no doubt aware that Klinsammn has yet to have both Clint Dempsey and Landon Donovan at his beck and call. Perhaps just as frustrating is the forced absence of José Torres, who seemed to the linchpin of Klinsmann’s midfield. While their unavailability certainly stunted the attack, it also makes Klinsmann’s personnel choices all the more puzzling. Torres' expansive play been missed. 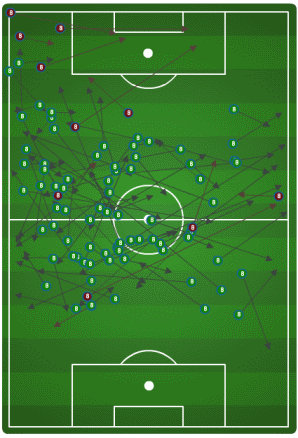 Few other American players could have put together a passing chalkboard like he produced against Costa Rica. In the United States’ final pair of 2011 friendlies, the manager called upon three holding midfielders (Jermaine Jones, Maurice Edu, and Kyle Beckerman), one combo holder/passer (Michael Bradley), one holder/winger (Danny Williams), and one creative player (Fabian Johnson). Any one of those center mids could have been replaced with a more attack-minded player. Both Sacha Kljestan and Benny Feilhaber, two proven if inconsistent creators, were available. Oddly enough, Klinsmann seems to be stacking holding mids at a rate Bradley was criticized for. It’s difficult to give Klinsmann a pass for the missing attacking personnel when he isn’t exactly going out of his way to bring creative players into the fold. While Jurgen Klinsmann certainly had some irritating extenuating circumstances to cope with, his puzzling personnel choices, the lackluster effort against Mexico, and the tinkering done by both managers leave no doubt that the end of Bradley’s reign was more successful offensively than the beginning of Klinsmann’s. Then again, offense isn’t everything. Come back next week as Ben documents the defensive data from the same matches. The results might be just as tilted in one manager’s favor. Gringos, what did you think of these stats? Were you surprised by how much better Bradley’s offense was? Fantastic “stat-mining” Blake. There is lots of talk and opinion out there, but I don’t think we’ll find side-by-side data like this anywhere. I am kind of torn. On the one hand I’m excited about Klinsmann’s experimental, long-term approach, but so disappointed that it hasn’t produced much flair yet. Playing 2 holding mids definitely gives your team a counter-attacking mentality. I don’t think that is in itself ‘bad,’ though it certainly should be situational (like, say, against Spain). My issue with Klinsmann is his early hesitation to play Michael Bradley. My guess is he’s trying to distance himself from Bob and has every intention of making Bradley the Younger a regular starter. While I think Jones and Edu are great options, what’s the deal with Beckerman? There’s a reason Bradley – who is 5 years younger – is playing in Europe and he is not. Ben and I have privately salivated over the idea of a Bradley/Holden/Torres triumvirate, or, if the US is heavily favored, drop Torres or Holden for a slightly more attack-minded mid. Bradley/Holden/Torres would be the ideal. Especially if you have Dempsey doing his “inverted left mid as a 2nd forward” thing like he does with Fulham. But I would also like to see Bradley, Holden and Torres flanked by Shea and Donovan with Dempsey up top… just to see. However, you still can’t understimate the comfort the US has with the 4-4-2. So in that case, I think you still get a strong pairing from any of the Holden/Bradley/Torres combinations. And yes, I have not mentioned Klinsmann’s Bornstein, Kyle Beckerman. Hopefully JK moves on from him as Torres and Holden return from their injuries. He really just makes too many mistakes at the international level.